Nationality: Japanese. Born: Shoji Shimazaki in Hyogo prefecture, 12 March 1905. Education: Attended night courses in English at Kansai University, late 1920s. Family: Married Masako, 1937. Career: 1928—formed amateur theater group, Shichigatsu-za; then joined a commercial group, Kindai-za, 1930, and appeared on stage in Osaka and on tour; 1939—joined the Shinsen-za group; 1934—joined the Shinko Kinema studio, Kyoto: first important film role in Chuji uridasu , 1935; later worked for other studios, including Makino, Nikkatsu, Shochiku, and, from 1941, Toho; 1950–54—roles in Rashomon and Seven Samurai brought international attention; appeared on television from the mid-1960s. Died: Of emphysema in Tokyo, 11 February 1982. Obituary, in Image et Son , April 1982. Obituary, in Films & Filming , May 1982. Takashi Shimura began his career playing villains or fools in many prewar films. His first major performance in Akira Kurosawa's Sugata Sanshiro began his ascendancy as one of Japan's most skillful and distinctive actors. Although he worked in numerous genres throughout his career, he is most often associated with Kurosawa's films, becoming an indispensible partner with him for 30 years. Shimura's first starring role was as the alcoholic ghetto doctor of Drunken Angel . He attempts to save the life of a reckless gangster, played by Toshiro Mifune, who suffers from tuberculosis. Their performances, showing strength beneath human frailty, depicted opposing attitudes towards the confusion of optimism and despair in post-war Japan. 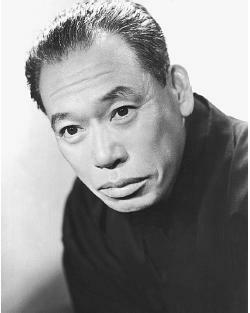 Shamiru continued to play characters with paternal relationships to the younger Mifune: in The Quiet Duel as a doctor who encourages his son to follow his profession; in Stray Dog as an older detective paired with a rookie; and in Seven Samurai as the leader of a group of samurai which includes Mifune. Two of Shimura's most impressive roles were as a villainous lawyer who awakens to the meaning of justice in Scandal and as a middle-aged bureaucrat in Ikiru . Learning he has terminal cancer, Shimura's character wishes to redeem his egocentric life by building a children's park. The dramatic change of this ordinary businessman as he wavers between hope and disillusionment became Shimura's screen monument.